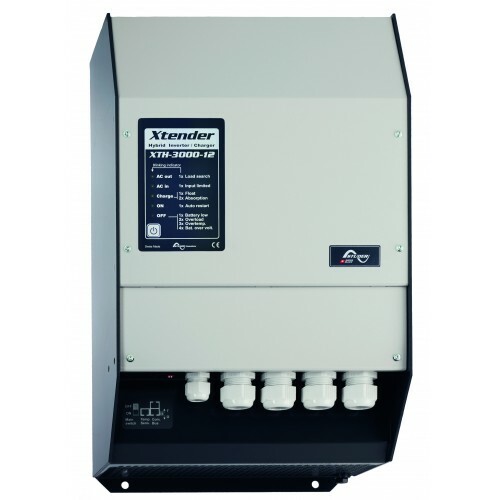 A series of products allowing for system capacities from 0.5kVA to 72kVA that allow for the optimal use of available energy, either as an off-grid inverter, battery charger, current injector, or support to an AC source. The Xtender is a high-tech device and a key player in the management of an energy system. The Xtender series is comprised of three groups by power level corresponding to the XTS, XTM and XTH models. Whether configured individually, in parallel, split-phase, or three-phase, these devices allow for complete flexibility with respect to the desired energy system concept. With its sophisticated software, the Xtender can be used in a wide range of applications. The Xtender series products are ideal devices for specific markets that need revolutionary solutions with all types of battery technologies. The Xtender fulfils the requirements of the majority of applications with its factory settings, which makes it a plug & play device. Energy flows automatically and the auxiliary contacts are configured to provide genset auto-start and alarm functions. The LEDs on the Xtender front panel allow the user to see in a quick glance how the device is working. The Xtender is a true energy manager, unique and compact, that has 5 main functions. It can be an off-grid inverter, battery charger, current injector, transfer system and provide support to an AC source. With these functions, the available energy can be managed and used in an intelligent and efficient manner.